Luangwa River Camp (formerly Luangwa River Lodge) in South Luangwa National Park consists of just five chalets thus catering for no more than 10 guests at any one time. The chalets are individually named; Mwala, Mazi, Merzi, Moto and Ziko and all feature unique decorative themes. Each chalet has an en-suite bathroom and a private deck with views over the park and river. The open plan lounge, dining area and revitalising pool afford excellent game viewing opportunities and delicious dining under an endless canopy of African stars. Luangwa River Camp offers a range of activities, including guided walking safaris, which originated in the area, driving and riverboat safari trips (depending on the water level of the Luangwa River). The camp also offers excursions to local schools and villages. When the river levels are high, a boat is used from outside the lodge to access the vehicles on the other side, inside the national park (or you can be driven around the river over the main gate bridge). Boat trips up and down stream can be taken when the river is at high water. In 2011 the camp was taken over by Robin Pope Safaris, who renamed it Luangwa River Camp. It is located about 20 minutes north of the main Mfuwe gate entrance to the park and is in a great area to explore in all directions both the game management area and inside the park. Big cats are frequently seen around the lodge including leopard and large prides of lion. Open: Luangwa River Camp is open from 22 January to 30 November. Location: The camp is located in South Luangwa National Park. Rooms: There are just 5 suites, all located on the banks of the Luangwa River. They have brick walls topped with a thatch roof. The ensuite bathrooms have a sunken tub with views out over the bush. Large sliding doors lead out to your own private deck. 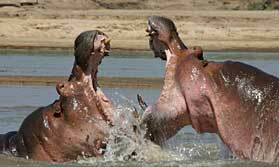 Activities: Day and night game drives are offered in South Luangwa National Park. They last roughly 4 hours. Cultural village tours are available, you can visit Chipembele, a local market and Tribal Textiles. From January to April it is possible to explore the lagoons and river by boat. Facilities: There is a dining area, bar, lounge and an infinity swimming pool. Communication: Guests have access to telephone, email and internet. There is also mobile reception here. "I was not crazy about the picture window in the bathroom as there were people walking by. They also needed to fix the shower head. But all this paled compared to the delicious food, the warmth of the welcome and the excellent guides." "amazing Alison and Tom went out of their way to make it a wonderful experience if doing it again would look at doing a direct charter from the plains instead of via Lusaka"
"A lovely camp, with staff who were absolutely determined to ensure you had a perfect holiday. The hosts, Tom and Alison, were friendly, interesting and have a great sense of humour. The cottages perhaps don't quite have the 'in the wild' feel of the tented camps, but they were very comfortable. The game viewing was very good, and additionally we had the opportunity to visit a local school, which gave us a chance to meet the children, and hear from the teacher about their suceeses and the problems they face." "I stayed here at the end of the green season. It was still lush and the river was still high. The first thing you notice on arrival by boat is the striking architecture and styishness of the place. The big main building is open, with high-roofed thatch. It's much less rustic-feeling than many other South Luangwa lodges. The rooms are private, large and well-equipped, and you feel like you're in your own little cottage (which you are really!)." "We were royally looked after, the game drives were wonderful and Victor the guide was very knowledgeable and obviously devoted to the wild animals. We really appreciated the fact that we were never â€œin a crowdâ€ and those in our small parties were mutually content to view the things others wanted to see. The lodge is in a glorious position. The staff went to a lot of trouble to cater for us giving us snacks and delicious brunches."